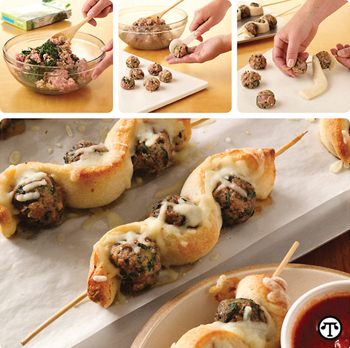 For a new twist on an old favorite, try these Meatball and Breadstick Sub Skewers. (NAPSI)—To spend less time cooking dinner and more time with your family, it helps to have a few simple yet delicious recipes at your fingertips. Fortunately, you can find hundreds of family-pleasing dinner ideas from the Pillsbury Bake-Off® Contest online. Many of them use seven ingredients or less (not including table salt or ground black pepper) and take only 30 minutes or less of active prep time. For example, there’s this recipe created by Kim Van Dunk of Caldwell, N.J., which uses ground turkey and Green Giant® frozen chopped spinach for a lighter yet full-flavored spin on traditional meatballs. Van Dunk, along with 99 other finalists, will compete for the $1 million grand prize at the 46th Pillsbury Bake-Off® Contest this November. Heat oven to 375°F. Line 2 large cookie sheets with parchment paper. Microwave frozen spinach as directed; cool slightly and squeeze dry with paper towels. In bowl, mix bread pieces and half-and-half; let stand 1 minute. With fork, mash bread until well blended. Add spinach, turkey, ¾ teaspoon salt and ¼ teaspoon pepper; mix well. Shape mixture into 36 (1½-inch) balls. Unroll dough; separate into 12 breadsticks. Thread one end of a breadstick on 10-inch skewer; add 1 meatball, leaving ¼ inch between dough and meatball. Repeat threading with breadstick and 2 additional meatballs. Place 1 inch apart on cookie sheet. Repeat with remaining breadsticks and meatballs. Bake 18 to 22 minutes, rotating cookie sheets halfway through bake time, or until meatballs are no longer pink in center and meat thermometer in center of meatball reads 165°F. Sprinkle each skewer with 1 tablespoon cheese. Bake 3 to 4 minutes longer or until cheese is melted. Meanwhile, in 1-quart saucepan, cook sauce over medium-low heat until thoroughly heated. Serve with meatball skewers. To find more simple, fast and tasty dinner recipes to please the whole family, go to www.BakeOff.com.